2 months 13 hours ago. Todd Reynolds shared a post. 8 months 2 weeks ago. Todd Reynolds shared a post. 8 months 3 weeks ago. Todd Reynolds shared a post. Pascal Le Boeuf is a force of nature, producing video after video, record after record. We put together some of my very favorite people to work with in this quartet, including Sara Caswell, Jessica Meyer, and Nick Photinos. Twas a pleasure to work for the first time with Kenneth Salters on drums as well. "Wanderlust" was originally commissioned for Lincoln Center Stage on Holland America Line Cruise Ships for which Isabelle Holmes and I curated the concert repertoire which launched the program. Congratulations to Pascal and Sara Caswell on their respective Grammy Nominations! 1 year 4 months ago. Todd Reynolds updated their cover photo. 1 year 9 months ago. Todd Reynolds is one of the founding fathers of the hybrid musician movement. Creating acoustic-electronica in real-time with only his 17th-century violin and a 21st-century laptop onstage, his sound mixes borrowed and home-brewed, avant and pop, jazz and classical. “A daredevil musician” (The New Yorker) his evolution is marked by long-time associations with Steve Reich, Meredith Monk, Bang on a Can, and ETHEL, the string quartet he co-founded in 1999. Now, comes his first solo album, ‘Outerborough’, a 2CD set that reveals him as both a composer and as one of the most sought-after interpreters of contemporary music. One disc–the InSide–features seven of Reynolds’ own works, many of which use looping and layering techniques over which his violin lines soar effortlessly or create deliciously expanding densities. The pieces range from electronica to Renaissance stylings (a minimalist version of ‘Greensleeves’) and the title track, ‘Outerborough’, inspired by train travel, written for a film by Bill Morrison. ‘Transamerica’, features West Coast beatboxer and singer Kid Beyond; and ‘Centrifuge’ was created for the super-human abilities of the GuitarBot (one of the LEMUR instruments recently featured on Pat Metheny’s Orchestrion Tour). The “OutSide” disc contains premieres of music by a host of New York notables, some connected with Bang on a Can, some with the über-popular the Books, and all with personality to spare. The electronic tones of Michael Gordon’s and Paul de Jong’s pieces belie their acoustic origins; Phil Kline manages to make the solo fiddle sound like a full orchestra on steroids; mash-up master Michael Lowenstern pays tribute to blues legend Robert Johnson; David T. Little’s ‘and the sky was still there’ incorporates the story of a soldier caught up in the de-humanizing policy of (recently-repealed) Don’t Ask, Don’t Tell; Nick Zammuto (also of the Books) fast-forwards a field recording for some time-compressed pastoralism. In his ‘Storm Drain’, Ken Thomson joins Reynolds on bass clarinet for a tight virtuosic romp that rises to fever pitch; Paula Matthusen explores language and memory in ‘The End of an Orange’, and Pulitzer prize-winner David Lang brings everything to a close with ‘Killer’, featuring thrashing and relentless violin lines which live alongside a just-as-relentless rhythmic track in what might seem like it was written for a punk band of one, all at once rebellious and incisive. 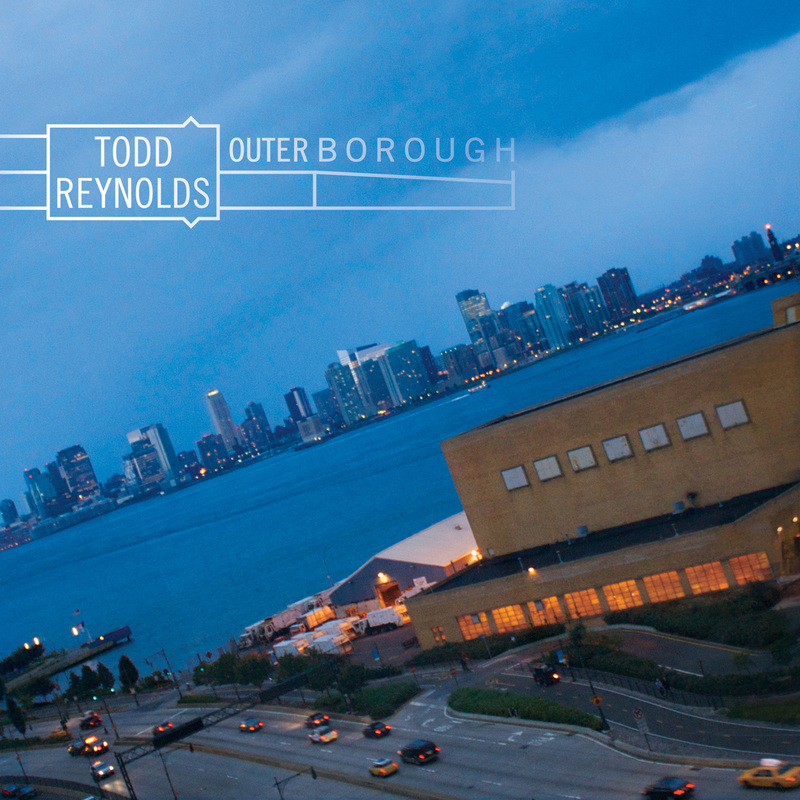 Violinist/Composer Todd Reynolds accomplished something very rare with Outerborough – creating unclassifiable music that is thoroughly modern but manages to be approachable, enjoyable listening. This album ended up on quite a few Best of 2011 lists, and gets our recommendation for fans of new music. Best of 2011. Out­er­bor­ough is the best exam­ple of the rest­less, cre­ative rela­tion­ship between com­po­si­tion and pop music going on in con­tem­po­rary clas­si­cal. At the beginning of the year, we commented on how Todd Reynolds collaboration with Kid Beyond was likely to be one of the better tracks of the year. Now, with the year winding down, not too many artists have submitted comparable work and that prediction stands pretty solid. This is kind of remarkable, because we later learned that this is what Kid Beyond is normally occupied with. But perhaps that is the lesson behind Reynold's Outerborough, where so many names make a brief appearance on the double-disc album: music is a collaboration of minds and passions. This is self-evident for musicians that are part of a band, but those who generally fly solo can get a much needed boost of inspiration and creativity simply by working with a new musician. Given that one's thoughts and experiences are unique, the collaborative effort is a reconciliation of alien methods with one's own. And so it is with Outerborough, which takes on a variety of musical types but maintains a consistent sound throughout, because, ultimately, Todd Reynolds is in the driver's seat. Outerborough is an impressive album, one that everyone should experience.